This is a collection of some of the projects I'm currently working on or have worked on in the past. This was created for a computer graphics animation class. 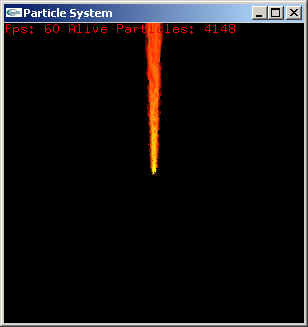 My goal was to write as efficient a particle system as I could. 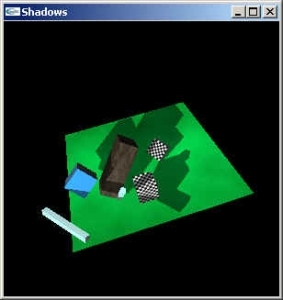 I have always been facinated with shadows in graphics and video games so I wrote this to experiment with different cutting-edge (at the time) shadowing algorithms. Real-time rendering techniques were my main interest in computer graphics. This project used hardware acceleration on low cost graphics hardware (the sort of stuff in your pc) to render volumetric datasets. This was once really cutting edge stuff, but the hardware out there now puts this to shame! This is a mass spring model implementation I did for one of my graphics courses. It's actually a really simple physics based implemention and the effects are great for materials such as cloth. This is a research project I worked on to experiment with deforming volumetric datasets using graphics hardware. At the time I worked on this the programmable graphics pipeline was just starting to get powerful. The deformations used textures filled with deformation information that were applied to the volumetric datasets with pixel shaders written in cg. My collision detection and response project was a lot of fun. I implemented collision detection using hierarchical sphere trees and classical newtonian physics for the response. This was an assignment I had in one of my geometric graphics courses. 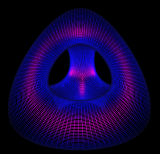 The purpose was to implement subdivision schemes with a focus on Catmull-Clark surfaces and Butterfly scheme surfaces. Battle Blocks 3D was a game I made that expanded upon Ev Pong. Getting used to the paddle in 3D can be tricky! This was one of the first games I ever made. I think it is awesome! I must say though, it wasn't the most well programmed application I've ever written.